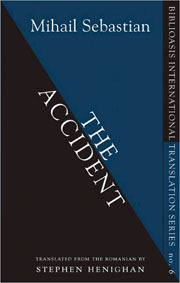 Mihail Sebastian’s The Accident takes place in 1935 in Bucharest, a cosmopolitan city free of stifling social mores. It begins with a chance meeting, in which a French teacher, Nora, is injured falling from the slippery steps of a tram; a bystander, Paul, reluctantly assists her home and helps see to her injury. Almost immediately, they embark on a one-sided relationship that feels predictable and somewhat shallow; there’s little about the characters or situation to draw the reader in. In each alien glance that was directed towards Ann, in each greeting, he seemed to see a memory and an invitation. . . . signals that went over his head like so many telegrams in code, which he intercepted without being able to read them, for nobody could assure him that each new greeting didn’t bear a message, an allusion or a proposition. Far away and deep down, close to his heart, something stopped in its tracks and waited to break or unravel. It was like being under a heavy anaesthetic: he felt the wound, he felt the skin’s resistance to the blade, and the very precise, very exact rending, and yet it didn’t hurt, it didn’t hurt . . . The novel then cuts away from Ann and back to Nora, where she and Paul reunite and journey to the Transylvanian Alps for a skiing expedition wherein Nora patiently attempts to resuscitate Paul’s feelings. Nora is a trooper, a sturdy, good-natured woman who is competent in virtually everything—including skiing. But is she too good? It’s as if she senses her position as replacement to Ann, although never knowing her competition. Her tactic is to be gracious and generous to a fault. As she teaches Paul to ski, he finds that his rediscovery of nature through the snow alters his moods, changing who he had become. But who are they, together? Which woman does Paul choose? Mihail Sebastian set The Accident in the time and place of his adult life, and similarities abound between the novel and own experiences. The timing he chose is relevant because it parallels his own identity struggle in pre-war Romania. Enjoying fame from writing both novels and plays, the Jewish Sebastian (born Iosef Hechter) also worked as a journalist with many noteworthy literary figures. However, Hitler’s ideas found fertile ground in Romania, with Sebastian’s peers distancing themselves from him and publishing anti-Semitic propaganda. The paper’s editor, Nae Ionescu, became a fierce proponent of fascism but added a religious element to its fervor. Sebastian may have considered this an act of defiance to resist Ionescu’s bullying, yet some Jews felt that by permitting the preface to remain he was giving tacit agreement to its contents. Thus, he was alienated from both his peers and his race. The question of true identity becomes a theme in his remaining works, which sadly are few as he died in 1945 after being hit by a truck. The Translator’s Afterword in this volume provides more details about Sebastian’s biography and unites them with several of the book’s themes; Stephen Henighan’s translation is precise and his notes show how closely he studied Sebastian’s life and work.